As a Continuing Care Retirement Community (CCRC), Viamonte is committed to providing the benefits of ongoing care and the assurance of predictable fees. Residents pay a repayable entrance fee and an ongoing monthly fee, which covers both their residence and a wide array of services and amenities. Both the entrance fee and the monthly fee are based on the size of the residence selected and the number of occupants. The Viamonte entrance fee is largely repayable at the termination of the Residence and Services agreement. The repayable portion will be paid to you if you choose to move from Viamonte, or to your estate upon your passing. The entrance fee assures you will receive all the benefits of residency, service and care. Our fees have been determined based on a financial model that is affordable and sustainable. Upon paying your entrance fee, you will have a sense of security knowing that if you experience an unexpected need for health care services in the future, our professional staff will be available to guide and assist you. Your dynamic living experience starts here. Contact us to visit the Preview Center and model home. 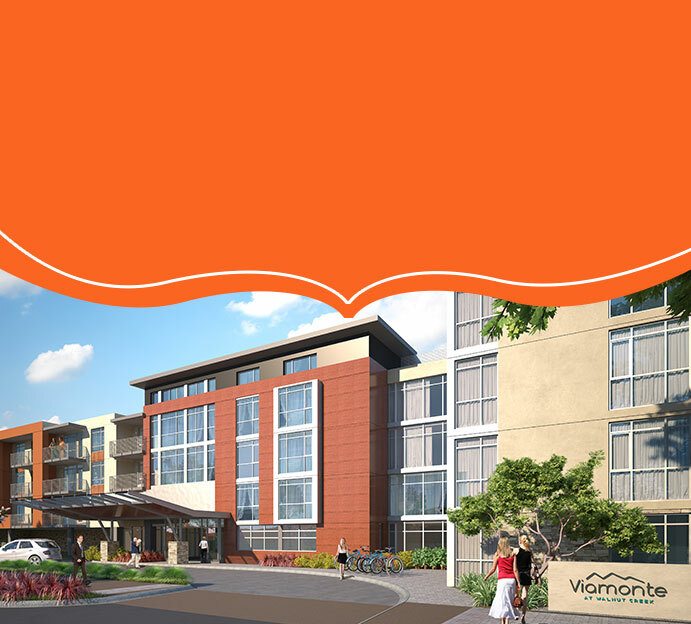 Set alongside shaded woodlands and connected to a bustling multigenerational retail and dining center just minutes from downtown Walnut Creek, Viamonte will place its residents at the intersection of nature and culture, serenity and vitality, creative cuisine and cosmopolitan shopping.